When I was in college in Cedar Rapids Iowa, there was not even the slightest attempt to be stylish – dark blue parkas with bright orange fuzzy lining in the hoods. Heavy boots. While I wasn’t much of an outdoor winter sports enthusiast, I don’t remember being cold walking across campus to class. And I had quite a lot of college freshman, cafeteria induced fat to keep me warm. I am pretty sure I whined anyway. But in grad school I was cold – all the time during the winter. Moving back to California had been a plan since the first cold day in the 4th grade after moving to Quantico Virginia. My dad had been transferred back and forth across the country several times and the military roulette stopped on Cold after that last wonderful period in Camp Pendleton. But I digress. The point of this is that so far the year has been pretty good – perhaps in part, because I have not had to suffer the brutal weather. But winter cold or not, we can all get brain freeze. One of the ways that I thought I might fight this affliction is to start being more creative. Creative in a tangible way. My daily drawing plan has been successful – missing two days – with multiple drawings the next day to catch up. I started with colorful markers on various types of paper. Lately I have been introducing new mediums – colored pencil and pastels. Some of the images are drawn from photos I have taken, some from imagination, some from the garden, the kitchen and the living room. I saw a series of incredible photos of Afghan children in Time magazine. I spent a week copying their amazing faces. I may try them again using colored pencils and see how different they turn out. But the subject that is getting the most buzz is my old mic series. 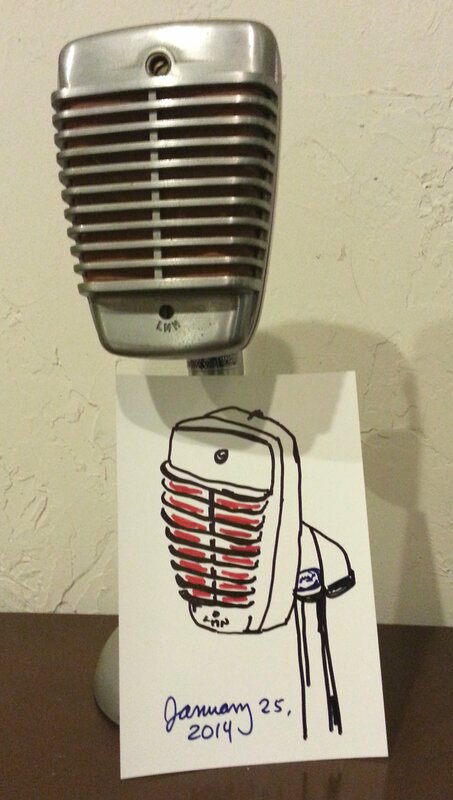 I have an old Shure 51 rescued from the Hidden Film Factory at General Dynamics in San Diego. It doesn’t work, but it sure looks cool on my shelf. So I drew it. Freehand. A quick sketch with Sharpie markers. Then I started digging for more. And suddenly I had eleven different old mics. Astatic, Shure, Tesla, RCA, Turner. The images are at Ego id Media right now getting sized and proofed. Now I have to figure out how to package them. But the bug has burrowed its way into my brain and I am working on some more to add to the series. I need 5 more to make another set of 8. Whatever happens, my creative juices have been squeezed. And I think it translates to my voiceover work as well. If you free up your brain and let things flow, you start to see new interpretations – new meaning to the words that stare at us in black and white. This is a good thing. So, so far 2014 has been good. May the ice gods tire of their games and retire to the clouds to drink ambrosia and my friends can thaw out. Perhaps the gods will decide to bless us out here in the West with some rain. Make it a warm rain please.